Well this is interesting. One of the key points at Apple’s recent press conference to discuss the iPhone 4’s antenna, was that the problem (called “attenuation”) is not unique to the iPhone 4. To highlight this, Apple showed videos of the problem on smartphones by rival companies. 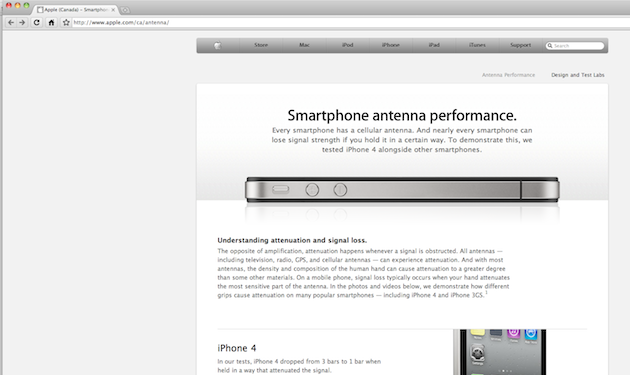 Those videos were then posted to a special antenna page on Apple’s website. Those videos are now gone. Here’s what else is interesting: the original page with these videos still does reside on the Canadian version of Apple’s website. Here’s you’ll find the videos for the BlackBerry Bold 9700, the HTC Droid Eris, the Motorola Droid X, the Nokia N97 Mini, the Samsung Omnia II, the iPhone 3GS, and the iPhone 4. However, the Asian version of Apple’s site has the videos removed as well. The videos are still up on Apple’s official YouTube channel, but they are no longer featured, and are a little bit trickier to find. We’ve reached out to Apple for an official response as to why they removed them from the website. 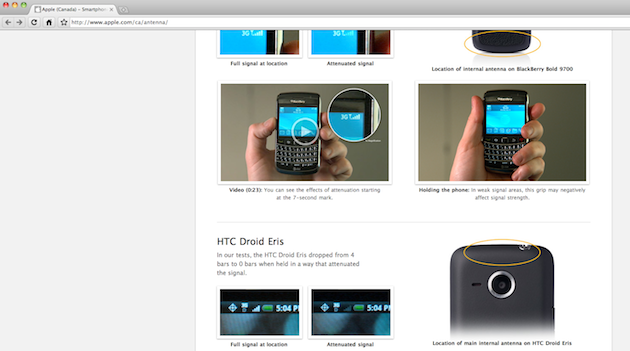 Obviously, they caused quite a bit of controversy — with some rivals, like RIM (makers of the BlackBerry), even responding. Has the threat of lawsuits from rivals forced Apple to take them down? Or did they take them down due to some of the negative backlash they were receiving? 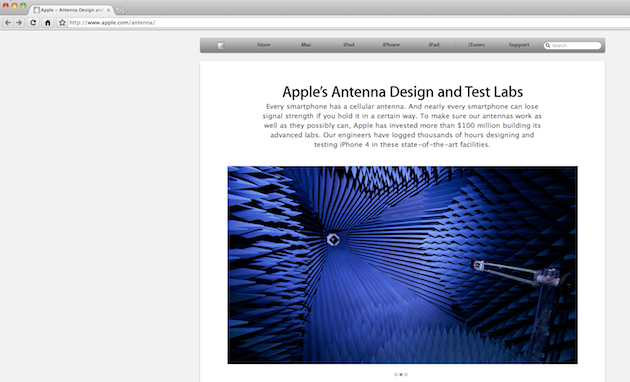 Or perhaps Apple is simply trying to move on from the situation — but again, the antenna design and test lab page is still there (though it doesn’t call out rivals specifically). At the top of this post, find what the /antenna site currently looks like in the U.S. Below, find what it used to look like — and still does for the Canadian version of the site.